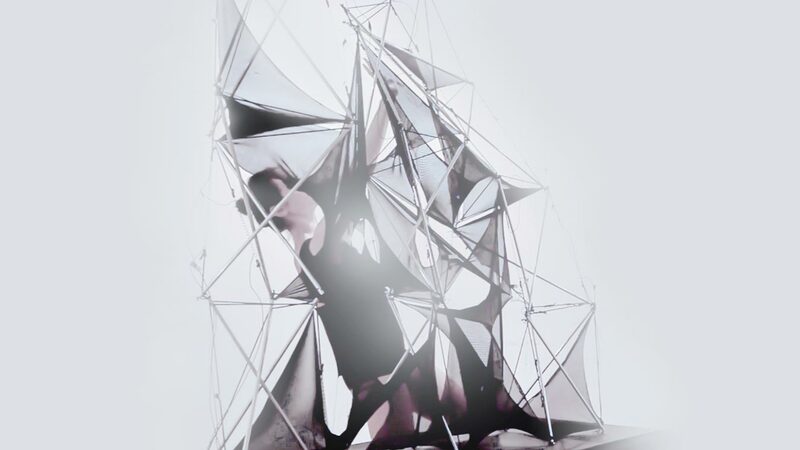 Alloplastic Architecture is an adaptive tensegrity structure that responds to human movement. The project was Behnaz Farahi’s Master thesis at the USC School of Architecture in 2013. 'Alloplastic' is a term taken from psychoanalysis. Used by Sigmund Freud, Sandor Ferenczi and others, the term refers to the individual influencing the environment, and causing it to change. 'Alloplastic' should therefore be contrasted with 'autoplastic,' where the individual has to adapt to the environment. ‘Alloplasticity’ may be construed as the more healthy condition, in that 'autoplasticity' is associated with neuroses.Within an architectural context the term has been adopted by Mark Goulthorpe who identifies 'alloplastic' with the possibility of a reciprocal transformation in which both subject and environment negotiate interactively. Central to this approach is the notion that for this process to happen most effectively there should be a common logic of behavior shared by both user and the environment. One response to this could be through the use of tensegrity structures designed to operate in an alloplastic fashion, and a pilot study has already been undertaken exploring the possibilities of this logic of construction. The advantage of this approach is that the human body itself operates as a form of tensegrity structure with muscles and flexible tissues operating in a tensile capacity, and the bones and other rigid members operating mainly in a compressive capacity. If both the body of the user and the structure of the environment itself are governed by a similar logic of behavior, then the modeling of the behavior of one on that of the other will be all the more easy to engender. Tensegrity structures are, of course, nothing new. The term ‘tensegrity’ was coined by Buckminster Fuller, and successive generations of artists, architects and engineers have developed the principle with an ever more sophisticated understanding of their behavior. What is new, however, is the potential for these structures to adapt and change their form. In this research project I used Shape Memory Alloy (SMA) springs and other devices that have come to operate as ‘muscles’ that can realign a structure within a constant overall equilibrium that is maintained as other springs or expandable elements adjust their length to compensate for that initial movement, thereby reconfiguring the entire structure. Another device that was explored in this research project was the use of the Kinect motion sensing device. Not only can this device begin to recognize bodily movements and judge distance and depth, but it also has the capacity to learn from users and adapt to them with time. As such this research could come close to engaging with the certain principles in neuroscience, and most specifically the concept of neuroplasticity that refers to the capacity of neural pathways and synapses to change in response to external stimuli from the environment. This process should be seen as a dialectical one whereby humans both respond to and model themselves on the environment, and also come to model the environment itself. In other words, neuroplasticity should be seen not simply as a passive response to the environment, but also as an active factor in the way in which human beings engage creatively with and change that environment. This refers not only to the choreographies of the human body within a space, but also – by extension – to the capacity for human beings to actually design that space. This project therefore addresses the potential of a reciprocal transformation between a user and an architectural element, whereby the environment can influence the user, but equally the user can also influence the environment. It also engages with a series of interdisciplinary challenges, ranging from a technological grasp of how such environments might be able to change morphologically to a psychological and neurological grasp of how human beings might themselves respond to those changes, and become active agents in remodeling and redesigning those environments.